Access control has certainly advanced over the years, and we offer our customers state-of-the-art access control solutions. Whether you are a homeowner or a business person in Corpus Christi and surrounding areas, we can gain an understanding of your objectives and provide you with the access control system that is right for you. Commercial entities often conduct business related activities within very sensitive environments, and high-tech access control systems have become very important to businesses. If you take the right steps, you can prevent the general public from entering designated areas. At the same time, you can also control access to certain rooms within your commercial space to limit access to specific staff members. There are various options available to you if you want to regulate access to your commercial spaces. Keypads with entry codes are one option, and proximity cards that can trigger access to areas of a facility are very widely utilized. 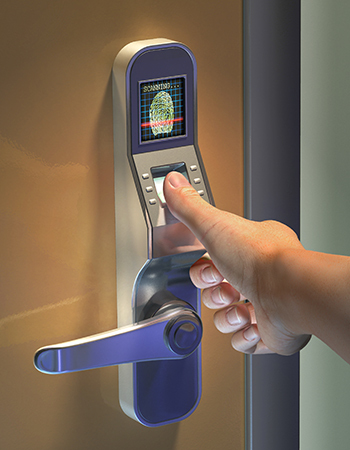 Biometric technology is now available, and fingerprint scanners provide the most secure form of access control. Monitoring of access can now be automated, so changing or removing someone’s access is possible. Contact us for more information. Back in the day, “home access control” would be a rather fancy way of describing a lock and key. During our current era, there are many different sophisticated home access control options. The old-school deadbolt keyed door lock is not your only choice. We can install modern home access control solutions to make your life easier. Most of them are similar to the commercial solutions that we offer, but they are typically implemented on a smaller scale. Our consultants can evaluate the layout of your property, work with you to gain an understanding of your objectives, and ultimately implement the ideal custom-crafted home access control solutions. The professionals here at Dynamark Security Centers are all about efficiency and security. If you implement the appropriate access control strategy, you can get in and out effortlessly as you simultaneously limit access to others. Contact us or give us a call us at (361) 852-5276 if you are ready to modernize your home or business.